I work at the best school in the District. In fact, I would go as far as to say that my school is the flagship school in the District. Aside from the completely renovated heritage-style three storey school, the grounds are tastefully landscaped, and the exterior has been beautified in recent years with colourful murals which reflect our diversity and our community spirit. The brand new enclosed hockey rink combined with a relatively new soccer field makes me proud when I arrive at work each day. 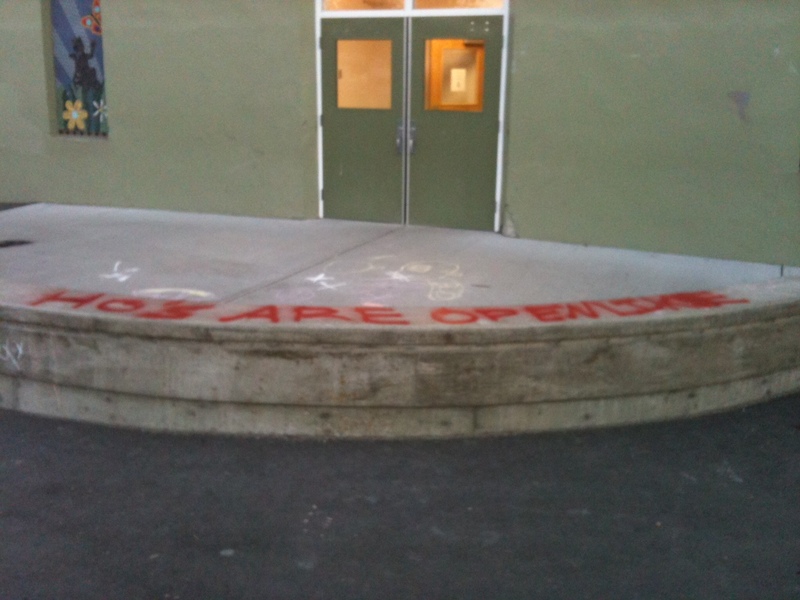 You can imagine how I felt when, on Tuesday morning, I arrived at work at 7am to find three separate messages spray-painted on the concrete at the south entrance to the school. I was outraged! 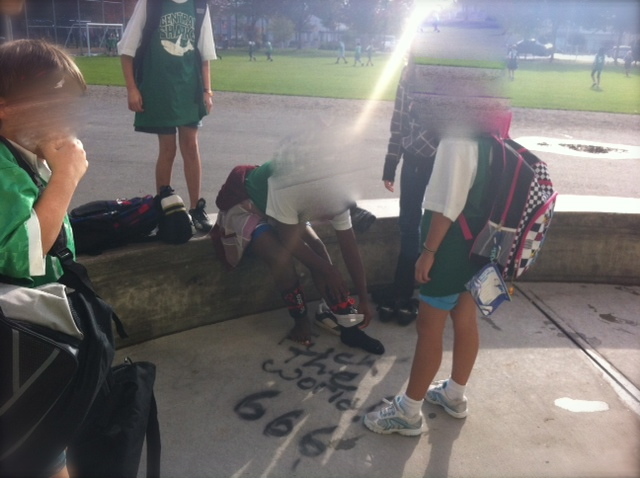 The messages read, “@#$% the world 666”, “We rule this town,” and “Ho’s legs are as wide as the hallways.” I could not stand the thought of students seeing the messages when they arrived at school, so I covered them up with garbage bags and masking tape. 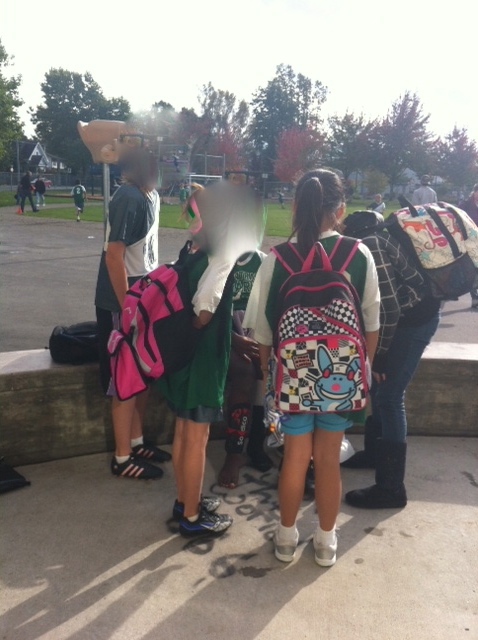 Shortly after school started, I used the experience as a circle discussion in class, which led to a writing assignment. A selection of student writing can be found below. I assumed that someone would be on their way to school soon to remove the paint. I was wrong. 72 hours later, two of the three messages remained. Not only that, but since Tuesday afternoon when the first message was cleaned, the other messages were uncovered and left visible for all to see. Could we have done better? There exists an unfair stigma attached to my school. 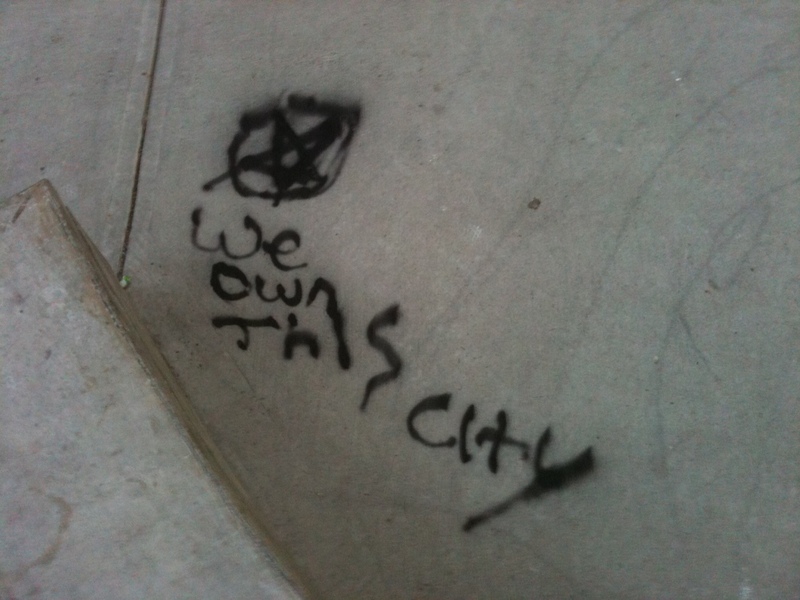 Some people call it an inner-city school, others call it the downtown school. In non-educational circles, it has been described as the rough school, and the troubled school. It is a myth. Granted, my school has its challenges, but the labels are unnecessary and unfair. By not acting swiftly enough, have we perpetuated the myth? A local elementary school visited our school twice this week for soccer games. On both occasions parents, teachers, and students from the visiting school have accessed the south-entrance and encountered the disturbing messages. Students at my school are some of the most socially conscious students I have encountered in the District. We engage our students several times a day on the topic of social responsibility. It is even one of our school goals. We use restorative circle practices, teach and reteach our school matrix, and have committed to a year-long program called, “Play Is The Way,” which teaches children social responsibly through play. In a nutshell our students, and in particular, our grade 5-6 leadership students, have a good sense of right from wrong. Could we have modelled a socially conscious attitude ourselves and worked to remove or cover up the messages so our students were not exposed to such filth? Could we have done better? I wonder if parent pressure in a different school might have resulted in a quicker clean up effort of these disturbing messages. If parents are not advocating for such things at my school, surely the school and the school district needs to be. I am not aware of our District protocol for such events, but I would like to see it reviewed. Disturbing messages need to be covered up before they are cleaned. 72 hours and counting, is too much time to deal with such issues.